Law of a country demands strict justice for any offense created to disrupt the balance of the administrative system. In case to restore the balance we need proper educational guide to proceed further in this stream. After the completion of Higher Secondary exam every students more or less made up their minds to choose their preferred streams. Law, being one of them, a thoroughly different stream from the regular Art, Commerce and Science subjects. Law colleges seek to focus on the jurisprudence that serves its parts on the ground of illegal issues, criminal offense and primary rights of the citizens of a country. Across the India, we have many renowned Law colleges that produce a quality amount of well reputed jurist known for their expertise. 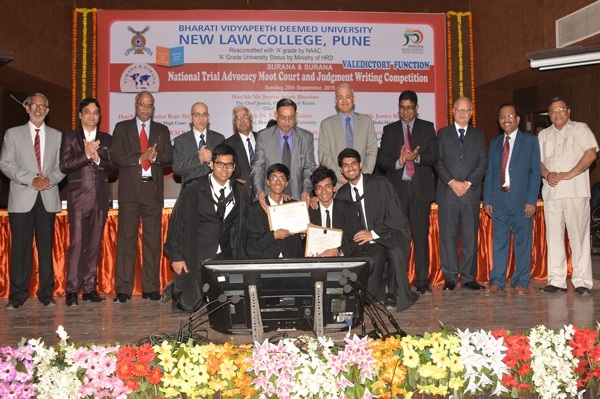 But here in this article, we will demonstrate about some of the best Law colleges in Pune. Pune, being a major epitome of cultural and educational centers in India, includes in its list some top Law institute of the country. Among them Symbiosis Law College, Bharati Vidyapeeth New Law College, ILS Law College, A.K.K. New Law Academy, Balaji Law College, PES’s Modern Law College, Sinhgad Law College are the current preferences for students who want to pursue advanced Law courses. While there are many options available for law colleges in Pune, few tips are provided here to choose the best out of it. Reputation : The reputation of a school, college certainly plays a major role to gain students. The law stream, which is not viewed upon in a positive light of image, surely needs to earn some big reputation as it represents the success story of their fellow students. It can be one of the key factors to deal the search of law colleges in Pune and to gain attention of guardians and students and there by lead to the preferences to make decision of admission. Placement & Internship : As it is a career oriented course and takes up a total duration of five years, you must research the career opportunities being offered by the law colleges in Pune. If the placement record is not satisfying it should be avoided. Along with the good placement opportunities, a leading Law school must provide judicial internship in top national or international Law organization during the school year. Faculty base : Well reputed law colleges in Pune must be filled with solid faculty profiles. You must calculate the teacher student ratio in the institute based on the faculty number. The more the faculty size improves, the better growth of education multiplies in the center. A good faculty body also serves to the reputation highly. Expenditure : A Law school, with the duration of five years, is not a poor’s deal. Most people belonging from middle or lower middle class background find it hard to afford the expense of total course. In case if it is beyond you can afford, you should avoid those prestigious private law colleges in Pune and instead look for government Law colleges those offer less budget for the course. Campus : An indoor campus with advanced facilities should be considered in the list of tips to choose top law colleges in Pune. The culture and environment of a campus surely add to the impression base of a student. Practical accessibility : A lawyer needs to apply the whole study on a practical ground, therefore, the best law colleges in Pune must provide with facilities for practical exposure like research clinics, journals, mock courts, mock parliaments etc. Library department : Before you choose to get admitted in one of the leading law colleges in Pune, you should extract record about the library house once. Because the greater availability of good books, the better the chance to expand the knowledge of Law stream. The above mentioned easy tips can help a good deal in your search to find some best Law school or law colleges in Pune or around.